Louisa Townsend was born on the Pacific island of Tarawa, one of the islands that make up the Republic of Kiribati, but left with her family when she was eight. After many years living in Edinburgh she has returned as a Detective Sergeant tasked with establishing an investigators program for the local police. However when a body is discovered at a local club all the island’s more senior police detectives are away from the island so Louisa is given the opportunity to oversee the investigation. This is a light, gently humorous tale that is a little predictable with regards to the ‘fish out of water’ trope but still offers lots of enjoyment. Aside from her cousin and some other extended family members no one knows Louisa is a Tarawa native but it doesn’t seem too likely she’d progress much more quickly with the investigation even if she did know as the island is depicted as more than a little backward when it comes to the idea of a woman being in charge of an investigation (or anything else). Louisa struggles to get the mostly male officers remaining at the station to do as she asks which adds to the difficulties presented by the isolated location and lack of resources. As a character Louisa is likeable but not loveable on my personal scale but I did enjoy meeting her. The frustrations she feels at the slow pace of the investigation and the notion that not everyone is treating the murder with the seriousness deserved is entirely credible and her struggles make her seem very human. She suffers from some obsessive traits and has a fear of germs but she overcomes or at least incorporates these into her life so that they don’t intrude too much and it does provide an interesting quirk to her character. The story was a little weak to begin with but got stronger in the second half – not least because some actual investigating progress was made and Louisa started making some real connections with some of the other characters. I was on tenterhooks during the dramatic sea voyage towards the end of the novel. I do have to say though that at times I felt like I was being invited to laugh at the locals and their idiosyncrasies in a vaguely unpleasant way. To be fair to the author I suspect this is more to do with the writing technique than any belief on her part in the superiority of ‘the civilised world’ as she lived on Tarawa for some years and writes very warmly of it. I’ve read a few modern crime novels featuring similar scenarios of outsiders working in exotic locations (for example Catherine Titasey’s MY ISLAND HOMICIDE, Andrew Nette’s GHOST MONEY, Timothy Hallinan’s THE FOURTH WATCHER and Angela Savage’s series which begins with BEHIND THE NIGHT BAZAAR) and did not get this sensibility with any of those novels even though they all depict differences between cultures and even the odd exotic eccentricity. In FOOD OF GHOSTS I think I’d like to have seen some more examples of the locals’ knowledge and customs having a positive contribution rather than just being odd or amusing though I appreciate this is a delicate balance and there’s a chance I’m being overly sensitive. Overall though I did enjoy FOOD OF GHOSTS. Louisa’s culture shock, the vivid depictions of the island’s natural environment, the vibrant community of locals and expats and a murder investigation that proves to have an entirely credible outcome all combine to form a jolly romp of a tale. 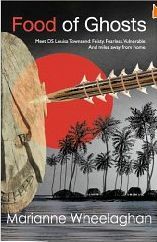 This entry was posted in book review, Kiribati, Marianne Wheelaghan. Bookmark the permalink. Glad you enjoyed this overall, Bernadette. I think you have a well-taken point about that delicate balance when it comes to pointing up differences in lifestyles, customs and so on. I see that also in Ian Sansom’s Mobile Library series, which features ‘incomer’ Israel Armstrong, who learns to work and live with the locals in the rural Irish Tumdrum and District area. It has to be handled carefully. Still, it sounds as though this was a really solid read. Hi Bernadette, I’m so delighted to discover your review of Food of Ghosts here and a big thank you for your very honest and thoughtful critique. As you, and Margot, have rightly said it is a delicate business introducing new cultures and peoples without appearing prejudice or inviting ridicule – and, as you also rightly guessed, it was absolutely not my intention to do any of the above. I suppose I did deliberately invite the reader to make superficial judgements in the beginning of the novel, but I did this in the hope the reader would go on to reassess her or his opinion by the end of the novel – in much the same way Louisa does and did. My aim was to show that regardless of ethnicity and how different and quirky (or even downright weird and scary) some peoples appear on the surface, when we get past these surface differences we discover we are all very similar underneath – it’s that Shakespeare thing about if you prick us do we not bleed etc: we all want to be loved and to love and while some people are kind and gracious others are plain mean and horrible and that is to do with human nature rather than culture. But I appreciate for you this wasn’t obvious (I was possibly being too tricky for my own good!) and I’m sorry for that but i am glad that you still enjoyed your read. Yay! And, as it happens, I am in the throws of editing the second Louisa Townsend novel, (so far called Killer Shoeshine) set mainly in Fiji but she also Kiribati. I would love to send you a review copy when the time comes, if possible, and hear your thoughts on novel number 2 in the series!